The Redfield Revolution 3-9X40 rifle scope is the hunter’s pick if you’re looking for a streamlined, simple, and compact scope. With its American style non-fast focus eyepiece and American-proud made-in-the-USA construction, there’s no other option if you’re wanting something that reflects your love for the red, white, and blue. A solid number of reviewers online feel the patriotic call to this rifle scope and have given it a great rating. The popularity of this model among hunters and tactical shooters is what earned this rifle scope into this review, as well as many other Redfield rifle scope reviews. It’s hard to beat the 3-9X40 model, especially when 4X zoom scopes are legitimately paving a way for themselves into the market. But today, it proved to be on top again. Well, for such an inexpensive rifle scope and a brand that has a reputation that borderlines minimalist, what can you expect to see that will wow you? Perhaps, the Accu-Range reticle, maybe a ballistic feature thrown in there, and the trusty American eyepiece system. If you have questions about it, let’s answer them! What type of reticle does the Revolution have? 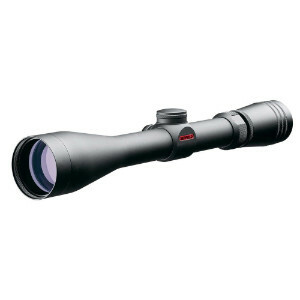 This Revolution 3-9X40 mm rifle scope is conveniently available with two different reticles. The standard is the Redfield’s 4-Plex which is your typical duplex reticle – nothing spectacular about it. The thicker part of the cross hairs end with the tip of a triangle shape, which plays a large part in the Accu-Range reticle. The Accu-Range reticle is the 4-Plex with an open circle at the center and a small ranging dot beneath it. Between the center, the dot, and the triangle tip of the cross hair, transitioning between targets at different distances is a breeze. It is the Accu-Range reticle that is on the Revolution model featured in this review. Does the rifle scope have a bullet drop compensation feature? Yes! The Accu-Range reticle is a ballistic reticle that can provide numerous holdover points to compensate for bullet drop for both standard and magnum rounds. You can view the ballistic chart for the Accu-Range reticle on Redfield’s website. For a standard round, the center of the cross hair will be zeroed to 200 yards. Each intersecting mark down the cross hair is representative of another 100 yards. Where the open circle meets the cross hair is 300 yards, the small ranging dot beneath is 400 yards, and the tip of the triangle of the thicker cross hair is 500 yards. This gives a full variation of 300 yards. For magnum rounds, the center of the cross hair will be zeroed to 300 yards, and the math repeats the same process as aforesaid. While it’s really a simple and basic ballistic feature, it’s still very impressive to see it on a rifle scope in this price range! The lens in the Revolution 3-9X40 rifle scope are fully multi-coated. Again, seeing this level of quality in this price range earns Redfield two thumbs up. One of the recurring compliments from reviewers across the board, is that the image quality is excellent. The clarity and light transmission has been constantly compared to various Leupold scopes. When it comes to their vapor deposited, multi-coated illuminator lens system, there are no complaints on this end. What kind of magnification power does the Redfield rifle scope have? This particular Redfield Revolution rifle scope has a variable power range from 3X to 9X. It’s one of three that have this same power range out of the five rifle scopes that make up the Revolution series. The versatile 3-9X variable zoom is the most common magnification range for hunters with all sorts of shooting distances and conditions. While it may be the well-accepted norm for now, the 4-16X variable zoom seems to be catching up in popularity, and has a highly contagious effect among today’s hunters. Does the Revolution scope come with a warranty? This model does come with Redfield’s full lifetime warranty that covers all non-electrical parts for rifle scopes manufactured from 2010 onwards. Because Leupold is the parent company, they issue and honor Redfield’s warranties. In fact, they have a first-rate reputation for not only upholding their end on warranties, but for also going the extra mile too. While this scope can be bought for under $200, getting Leupold’s warranty with it is a steal. Are there any other models in the Revolution series? This particular model is only one out of five in the Redfield Revolution series. The other models are the 2-7X33, 3-9X50, 4-12X40, and the TAC-MOA 3-9X40. You can find all of these rifle scopes for less than $350 online. Does this rifle scope have a fast focus eyepiece? The Revolution series features the American style eyepiece system. This is almost the most preferred type of eyepiece among old-school and traditional hunters. The non-fast and classic system is more secure than the popular fast focus eyepieces that we’re seeing more of these days. The rifle scope has a large threading area for the entire eyepiece to be rotated until you have your reticle in focus. The eyepiece also has a convenient knurling in it to help out with twisting and securing. While there are benefits to the non-fast system, it still is a little slow and time-consuming if you’re comparing it to fast focus. To help counteract this, Redfield came up with the Rapid Target Acquisition (RTA) technology to still get you dead on when time is of the essence. According to the bull’s-eye, the Redfield Revolution 3-9X40 with the Accu Range reticle will get you pretty darn spot on when shooting in the field. It’s a beautiful scope with nothing fancy to interfere with its high-performing abilities. However, some reported complaints reveal buyers have had to deal with issues related to clarity or the reticle. Fortunately, this doesn’t seem to be a consistent trend with Redfield products. Using the Leupold warranty will address any issues you may come across. We have given this Redfield a spot on our list of the best rifle scopes under $200… But if you have the budget to stretch it a tad for the best of what Redfield has to offer, the Redfield Revolution/TAC 3-9X40 rifle scope is it! There’s quite a few differences that makes it a hit with the hunting field. If you want to know what they’re raving about, check it out to satisfy your curiosity. If you wanted to go straight to Leupold, you could always consider the Leupold VX-1 3-9X40 rifle scope. It’s practically the same scope as the Redfield Revolution, but it also has Leupold’s Multicoat 4 coatings that might swing you their way instead. Not that we’re trying to convince you to choose one over the other, we’re just throwing out all the options. Redfield is far from being the bottom of the barrel brand. They offer high quality, high-performing scopes made in the USA for as cheap as you can get it. If you’re red and hot for a premium scope, Redfield is the right kinda fuel for your hunting fire! Mil vs MOA: Which is Best for Hunting, Beginners & Long-Range Shooting?